This tutorial explains how to scrape Rotten Tomatoes for audience reviews. You can do it easily on your PC with the help of a simple command line tool, rotten-reviews. Here this tool takes movie name and number of pages from you to get the reviews. 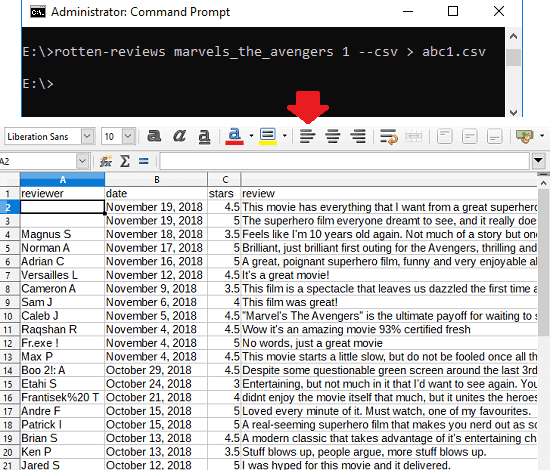 It can save the movie reviews in JSON or in a CSV file. It scrapes the review text, name of the user, date and time of review, and rating. And not only the movies but using this tool, you can scrape audience reviews for TV shows as well. And apart from using from command line, you can use it in your own applications like an API to get any number of movie reviews. If you like scraping websites for getting some useful information then you should try this simple and unique tool. You can download reviews of any movie or a TV show and simply save them in a file. However, this tool can only get you audience reviews. Reviews by critics will not be included in the output. And there are some additional command line options that you can use to get the output in different ways. How to Scrape Rotten Tomatoes for Audience Reviews? 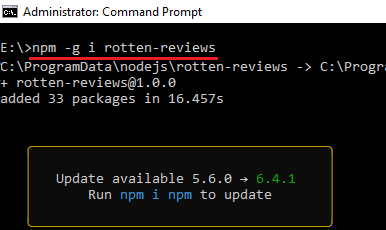 To use this command line tool, rotten-reviews you just need Node.js installed. You can use this tool on any platform to get reviews in just a few seconds. The time taken to download reviews depends on the number of pages you want to scrape to get them. These steps will be helpful in getting started with this tool to download Rotten Tomatoes reviews. Step 1: Install Node.js if it is not installed. After that, open command prompt with admin rights and run this command to install this tool on your PC. Step 2: Now, you can start using this tool to scrape Rotten Tomatoes reviews. Run the following command to download audience reviews from the specified number of pages. And to specify the movie name, you will have to get it from the Rotten Tomatoes page of that movie. See the following example. By default, it will leave the output in the terminal or command prompt (JSON format by default). But if you want to save the data in a file then you can use this command. It will save the output in the file that you specify. rotten-reviews "MovieName" "NumberOfPagesToScrape" --csv > "FileName"
Do note that, it scrapes the reviews ranging from newest to oldest. On a single page, there are 20 reviews and you can specify the page numbers in the command according to the number of latest reviews you want to grab. 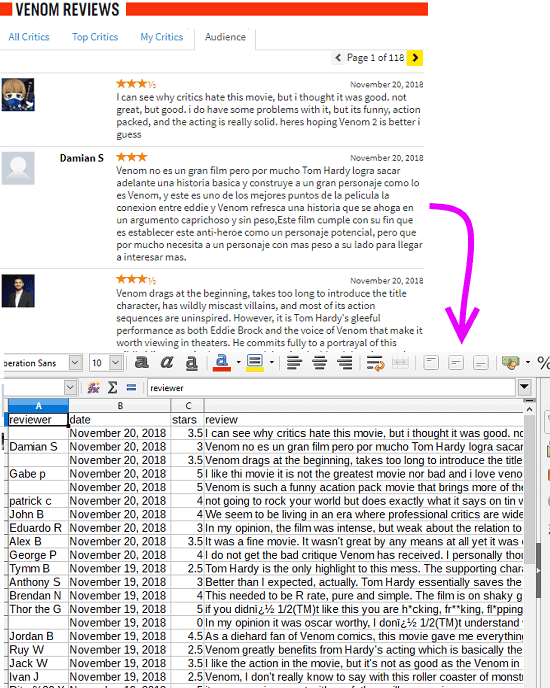 Also, this is a cross-platform tool so you can run it in the same way on MAC and Linux to scrape movie reviews. How to Scrape Instagram Comments? How to Scrape Amazon Product Data to CSV? 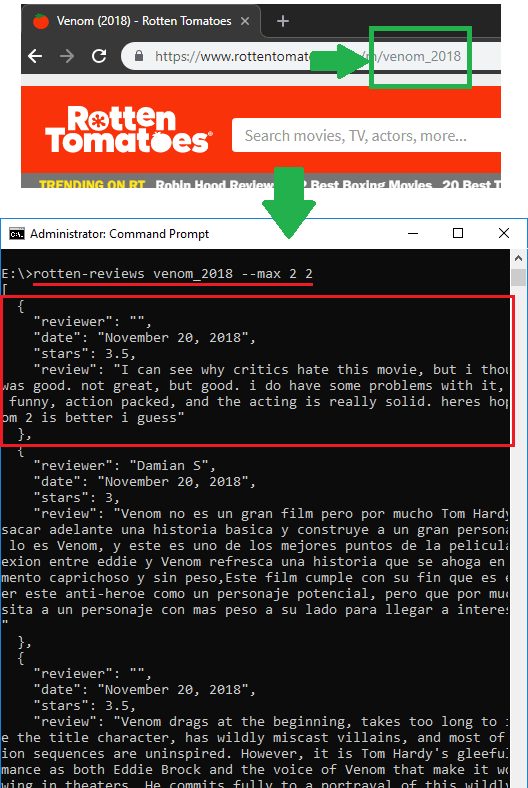 If you like command line tools to get things done then why not scraping movie reviews. You can grab audience reviews of your favorite movies from Rotten Tomatoes. The tool that I have mentioned above is really powerful, fast, precise, and works right from the terminal. Although, I didn’t try it to get huge number of reviews but it should work to scrape all pages to download movie/TV show reviews.